For those who are searching for "Made in America" furniture, here are just a few of the companies that manufacture furniture in the U.S. This list tries to provide an idea of how many companies still make furniture domestically. It should be noted that there are different degrees of Made in America, just as there are different degrees of green or environmentally friendly furniture. It should also be noted that, generally, most upholstery companies manufacture their furniture domestically, while most case goods are made overseas. Some of the manufacturers featured here are carrying forward a tradition started decades ago, while others are much newer. Simplicity Sofas was established in 2007 and make RTA or ready to assemble sofas. The company manufactures large and small sofas, apartment sofas, studio sofas, sleepers, and sectionals. All furniture is made at its High Point, NC plant. The company offers full refunds if the customer is dissatisfied, and cushions and frames come with lifetime warranties. Featured here is the Lorelei Sofa. Copeland Furniture is located in Bradford, Vermont, and produces furniture made from solid maple which comes from within 100 miles of its factory. The company has been manufacturing furniture for over 30 years. Influenced by the Arts & Crafts, Mission, Shaker, and Scandinavian furniture, Copeland continues to produce high-quality furniture that is also environmentally conscious. Copeland's wood is also FSC certified. Recently, Copeland introduced new custom tables with multiple finishes, shapes, and hardware. These finishes are available on cocktail tables, end tables and sofa tables, and a media console and cabinet. These tables will be available in stores carrying upholstery from Rowe Fine Furniture. Johnston Casuals is a company that manufactures occasional pieces and contemporary dining groups. It does so from its state-of-the-art facility in North Wilkesboro, North Carolina. Taking advantage of modern technology as well as a tradition of craftsmanship, Johnston Casuals combines state-of-the-art robotics with the work of skilled artisans to produce casual dining collections, tables, bars and bar stools. The furniture is eclectic, affordable, and environmentally friendly as it applies green practices in manufacturing and reclaims and recycles its material. Johnston Casuals also ​offers to refinish its furniture, thus extending its lifetime. Kincaid manufactures a large percentage of its furniture at its U.S. facilities in western North Carolina. Kincaid manufactures a variety of furniture including bedroom furniture, dining furniture and occasional furniture. Kincaid also has a line of Memory Foam bedding that was recently recognized as an industry best by the trade publications. 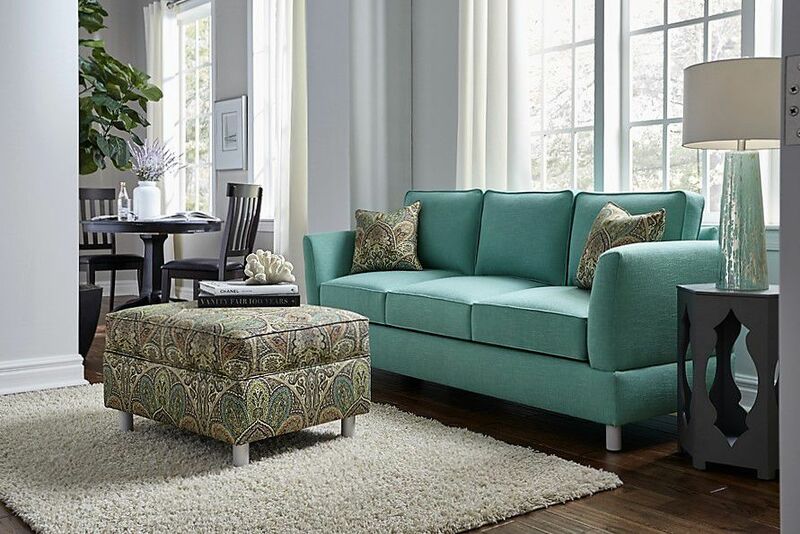 While offering over over 25 collections of beautiful solid wood furniture, Kincaid offers an extensive line of custom upholstery. Vaughan-Bassett Furniture Company manufactures bedroom furniture, from its factories in Galax, Virginia and Elkin, North Carolina. It is the largest manufacturer of wooden adult bedroom furniture in the United States. Most of its furniture is made of wood solids and wood veneers grown and harvested near its own plants in the Southeast. Vaughan-Bassett mainly uses pine, oak, maple, cherry, ash, poplar, birch and beech in its bedroom collections. Vaughan-Bassett features furniture that is based on American styles. The Lattice bed featured here is part of Vaughan-Bassett’s Trends Collection retailing for just $499 in queen. Featuring cherry solids in two finishes, the entire bedroom will sell for only $1,799. Marc Taggart & Company makes American furniture with a very distinctly Western style. Their Molesworth furniture pays homage to Thomas Canada Molesworth who furnished the Moses Annenberg lodge and hotels in Wyoming and Montana. Molesworth's work became so popular in the 1900s that he went on to furnish the homes of some very notable celebrities, including the TE Ranch which had once belonged to Buffalo Bill. The family-owned company was founded by the present owner's grandfather, who was one of Molesworth's first customers, and the family maintained a relationship with him. The reproductions are signed by the craftsmen who make them and are also numbered to make authentication easier.